Desktop-as-a-Service (DaaS) lets you run your desktop in the cloud. Access your desktop and applications over the Internet, from anywhere, any time and on any device. Reduce IT costs and maintenance, be more productive and increase data security. wherever you go, on any device! Allow your employees to access their desktops and applications from a PC, Mac, tablet or smartphone. Save money by paying only for what you need, when you need it! Managing your virtual desktops on a hosted server makes it easier and cheaper to streamline your IT assets, including upgrades and management. Customize and scale your virtual workspace as your business needs change. Apply updates and upgrades instantly without the hassle of managing IT infrastructure. Don’t put your business at risk with vulnerable and outdated software and hardware. Storing your assets on a hosted server means your organization has access to the latest software versions. LOOKING FOR AN EASY DaaS SOLUTION? Provision a complete IT environment within two hours. And without any involvement from an engineer! Everything you need in just three clicks or less. Control all of your clients’ IT environments from a unified management interface. A single pane of glass for your managed services business. Dial up or down Azure’s compute and storage usage to match your customers’ needs. If customers don’t need it, you shouldn’t have to pay for it. 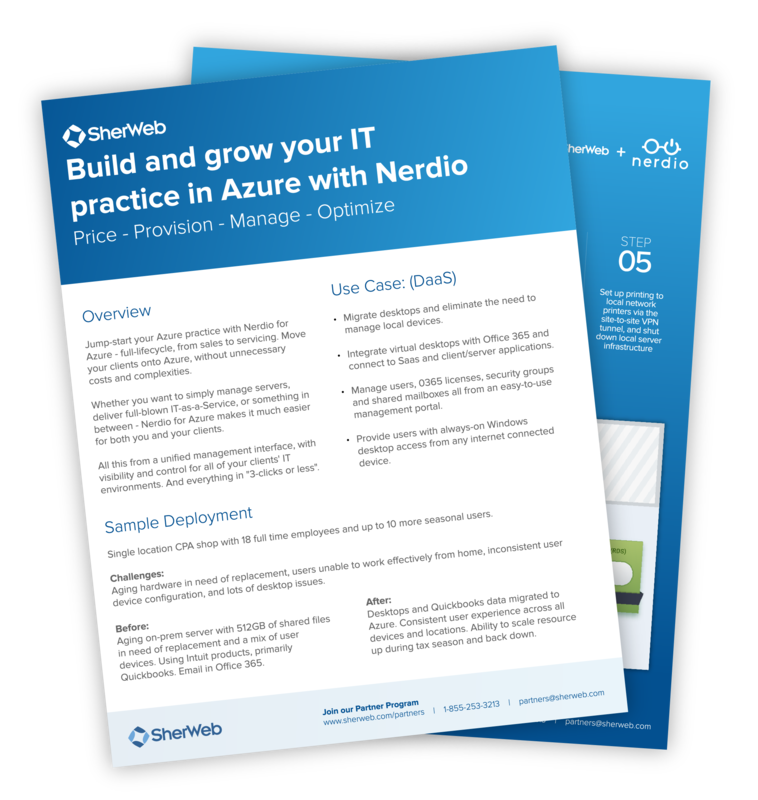 Manage backups with every Nerdio for Azure plan – done as frequently as you need them. Automatic backups for peace of mind. Measure real end-user experiences instead of difficult-to-interpret system metrics. Gain insights so you can optimize accordingly. WANT TO LEARN MORE ABOUT SELLING NERDIO’S DaaS SOLUTION?